Another human foot inside a shoe has been washed ashore on Gabriola Island in the British Columbian Salish Sea. It brings the total number of disembodied feet discovered in the area since 2007 to 19. On the afternoon of Sunday, May 6, a man out walking near the shore discovered the hiking-boot-clad foot, wedged inside a logjam. In a statement, the Royal Canadian Mounted Police said it is working with the BC Coroners Service to identify the person to whom the foot might have belonged. 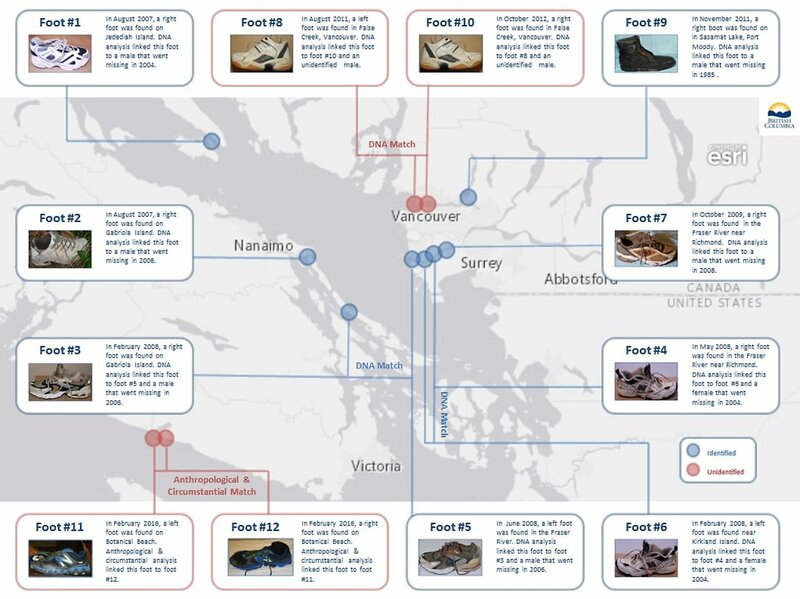 Detached human feet in various states of decay have been appearing along the coast of the Salish Sea in southwest British Columbia since 2007 - most of them inside either hiking or running shoes, and usually found by civilians. The most recent foot before this one was found in December 2017. Of the 19 feet to date, 14 have appeared in British Columbia, and the remaining 5 washed ashore in the US state of Washington, on the other side of the Salish Sea. But, although the phenomenon is a gruesome one, authorities aren't too concerned about a mad, foot-lopping serial mutilator on the loose, partially because none of the feet show any signs of trauma or having been forcibly removed. And there's another reason authorities don't suspect foul play. Prior to the December 2017 discovery, the Coroners Service had identified eight of the 12 feet that had washed ashore since 2007. They traced them back to six individuals (four individual feet, and two pairs), all of whom had either committed suicide or gone missing and died accidentally, the Coroners Service said last year. So how are the feet getting washed ashore, but no other parts of the body? And why - advanced decomposition aside - are they still intact? It's probably the shoes themselves, experts believe. "Feet easily disarticulate and when they are attached to a flotation device such as a running shoe, they are easily washed ashore," Gail Anderson, a forensics expert at Simon Fraser University in British Columbia, told Vox last year. "Notice there are no feet washing ashore in stiletto heels or flip flops. Also today's running shoes are much more buoyant than in the past." In addition, the shoe (and sometimes sock) protects the foot from hungry marine creatures; and it's not uncommon for the feet to saponify, wherein the fatty tissue turns into a solid, soapy, wax-like substance called adipocere. However, while it's unlikely foul play was involved, the circumstances that lead to a foot making its way to the shore of the Salish Sea are always unpleasant ones. And identification of the remains isn't always easy. Sometimes the feet are greatly decayed. It can also be difficult to match a foot to a missing person based on the information provided to police, and DNA can be too degraded by the salt water for a viable sample to test. So the RCMP and Coroners Service may take some time to identify the foot. However, their brief announcement of the grisly discovery doesn't seem to offer a lot of hope. "No further remains were located," it says. "No further information is available at this time."